Malta’s national football team came in for considerable flak on social media for having celebrated with pizza after winning a hard-fought draw against Azerbaijan in the UEFA Nations League on Sunday. But according to health experts, keyboard warriors taking pot shots at Maltese players are off the mark, no matter how you slice it. “It would be a problem if they were doing it regularly, but otherwise there’s nothing wrong with it,” sports nutritionist Joe Sciberras told Times of Malta. “Generally speaking, athletes with a series of matches or events need something high in carbohydrates after exerting themselves. Otherwise, something with 20 to 30 grams of protein is ideal, to help with muscle adaptation”. His views were shared by a sports physiotherapist, who asked not to be named. “After a match, players have to take care of what we call the ‘three Rs’,” he explained. “They must replenish their energy levels, rehydrate after sweating, and repair muscle damage. That means carbs, liquids and proteins,” he said. That expert advice is backed by empirical research. In 2015, researchers found that athletes could even have a burger and chips after an intense workout and not experience any drop in performance. 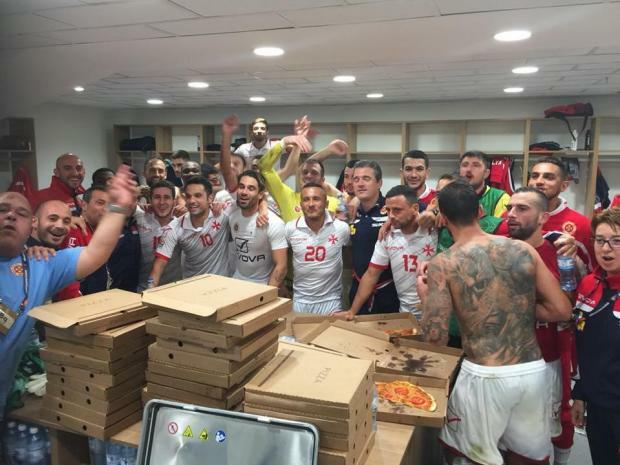 Controversy about the Malta team’s choice of a post-match meal began rumbling on social media after the Malta Football Association posted a photo of players celebrating in the dressing room alongside a stack of takeaway pizza boxes. The team had just drawn 1-1 against Azerbaijan in the UEFA Nations League. As critics lashed out at the team for their seemingly unhealthy eating habits, pizza talk almost ended up overshadowing the team’s performance on the pitch. “This wasn’t a training session. It was the end of a competitive match, which the team ended with a good result,” noted Mr Sciberras. “It’s important that dressing room morale is kept up, and there’s absolutely nothing wrong with celebrating with a pizza”. Local experts are not the only ones to see nothing wrong with a post-match slice or two: at Serie A team Empoli, pizza is on the menu after every single home match, with the club’s medical team having specifically listed it as an ideal foodstuff to quickly recover energy spent during a match.